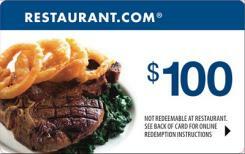 Get a $100 Gift Certificate from Restaurant.com for only 1300 Swag Bucks! A Restaurant.com Gift Card is good for more than 18,000 participating restaurants nationwide - including some of the hottest names in dining as well as premium online partners. Visit www.Dine.Restaurant.com for participating restaurants. Make sure to check Restaurant.com BEFORE snagging this prize to see if there are restaurants in your area.